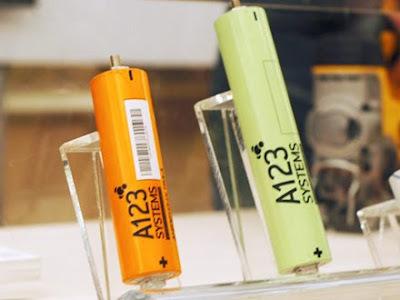 A123 Systems announced a deal to sell 44 megawatts worth of its lithium ion batteries to AES Energy Storage, a step toward the technology's use putting solar and wind farms on the electric grid. AES said it will use 20 MW of the batteries to regulate frequency on the New York grid, the same kind of application needed for giant wind and solar farms. AES's corporate parent said it will use lithium ion starting in 2011 to handle such regulation for a 32 MW wind plant it operates in West Virginia. "We wouldn’t be doing projects at this scale if there was still product development" needed in the technology, said Chris Shelton, president of AES Energy Storage, LLC in an interview. He would not reveal financial details of the A123 purchase. However, he did say part of the New York plan depends on closing loan guarantees with the U.S. Department of Energy. AES has operated since December 2009 a 12 MW energy storage system installed by A123 at one of its power plants in Chile. That system is based on battery technology A123 developed for a hybrid bus for BAE Systems, Shelton said. Although the technology for grid-scale lithium ion storage is ready, the regulations and financial incentives are not, Shelton said. Congress is debating investment tax credits for buying grid-scale lithium ion batteries. Regulators are discussing pay-for-performance metrics that would let companies like AES charge a premium over competing power plants because they can supply energy faster and with greater precision. Regulators also need to hammer out ways to enable risk-averse utilities to acquire new technologies such as lithium ion, something utilities are reluctant to do that with rate payer's money today. AES is negotiating deals to sell systems and services using A123's batteries to electric utilities, but so far it has only installed the systems at its own power generation plants.